The women of Eel Falls First Independent Christian Community Church Ladies Fellowship are a strong-willed, opinionated bunch. And I'm their fearless leader. "Ladies, ladies." I clapped my hands and spoke in my sweetest let's-get-moving voice. "We have events to discuss, and I need your attention." Another smile and a rap on the table. Women screamed, my mouth flew open, and Dorothea clasped her heart. Goliath and Timmy came barreling through the church basement door covered head-to-toe in mud, rejoicing in foul-smelling, slimy delight. All I could see were Timmy's white teeth and the rims of his eyes. Goliath barked and danced around Timmy like an organ grinder's monkey. A really big one with bad breath. I whispered a prayer for God to deliver me from the dog that so easily entangled Maude's new Vera Bradley handbag. I slammed my eyes shut, but Goliath's bark snapped me back to reality. I threw my hands over my eyes and peeked through my fingers as the giant mastiff braced himself to shake off the pond scum. Dread gurgled from deep inside me until it erupted like Mt. Vesuvius. "Nooooo!" Like a slow-motion horror film, Goliath shook every inch of his 213-pound extra-wrinkly-skinned self. When he finished, the ladies at the table's end were smothered in muck and drool. "Pond!" Timmy smiled with pride and pointed out the door and down the street to the pond in front of our house. "Pond!" I looked at my good friends, Lily and Opal, and made a silent plea for rescue. They both nodded and grabbed Timmy as I dashed toward Goliath who had Bernice pinned to the floor, licking her like a Popsicle. His head was twice the size of hers, and he ignored her screaming and the violent kicks of her size-ten feet. She swung at him with her handbag, and he responded as if it were a fabulous game of tag, woofing and slurping with fervent delight. If the cantankerous matriarch hadn't used an entire can of hairspray, he would have inhaled every curl atop her freshly-styled head. Bernice might not have been able to see through glasses covered in muck, but she could scream. "Norman! Help! I'm being attacked by a mad dog!" And she bellowed something about the immediate return of Christ and the rapture of the dead. Everyone else yelled at Bernice to shut up. Finally, Lily caught Goliath and took Timmy and the monster dog home. I helped Bernice crawl out from underneath the table and tried to clean the sludge from her floral-patterned blouse. She spun in a circle and slapped my hand away. "I never..." Bernice's eyes blazed with fury. I fought hard to hold in my laughter. I'd never known her to be speechless. Bernice wiped at her face with a small hankie, but it covered little territory. "I never, I never..." She attempted to pat her hair back into place. Her left eye peeked out from a circle of mud and a small piece of algae clung to her twitching eyebrow as she glared at me. "The pastor and board will hear about this. I never..."
I did my best to restore pastoral peace and harmony to the group by closing the meeting in prayer, but I don't think their hearts were in it. All the ladies left except for me and Mrs. Huntington. Together we mopped up the mud, but I had a feeling we'd be discovering new spots to clean for months. After she left, I went outside to empty the mop bucket. The air was warm and stars peeked through a dark, cloudless sky. I spilled the dingy water on the ground and took a deep breath. And then I slumped to the grass and sobbed. "Is this all there is to being a pastor's wife, God? One mess after another?" I stared down at the puddle I'd made as it swirled and reflected dancing stars at my feet. Some people, when God speaks to them, hear harps, or bells, or angels singing. The apostle Paul, Alexander the Great, and Joan of Arc saw a bright light. But in the distant darkness of night? I heard a call. The unmistakable rumble of the one thing on this earth—besides cheesecake—that makes my heart flutter and goose bumps crawl from the base of my neck to the tips of my purple nail-polished toes. I raised my head slowly and saw a vision. Cobalt blue, mixed with shimmering chrome, reflected the moon's silver rays and sang in deep, rhythmic tones. I stood transfixed, completely mesmerized in the glimmer of metallic paint. The moon danced on chrome pipes that vibrated in sync with the steady cadence of the V-twin's deep symphonic timbre. My enchanted heart beat in fifth gear, and I released an audible sigh. Caught up in rapturous wonder, my eyes followed Reba O'Malley as she maneuvered her Harley Davidson Road King around the corner and past the church. I waved as she passed, but she didn't see me. 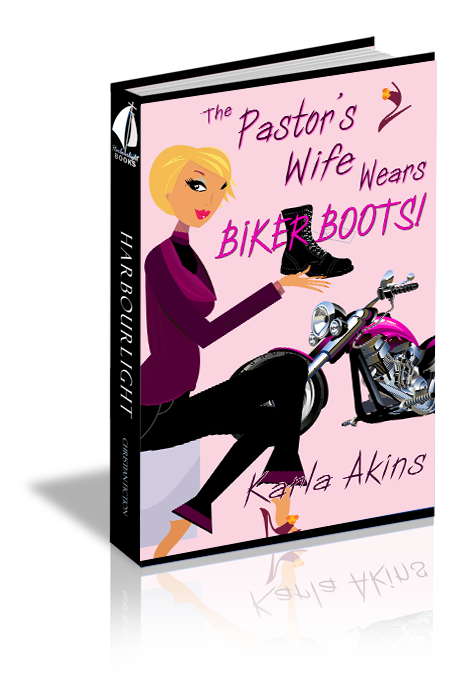 "Lord," I whispered as my eyes followed the bike's graceful rumba down the road, "are there Harleys in heaven?" The only answer was the guttural rhythm of Reba's dream machine calling me to adventures I'd never known.